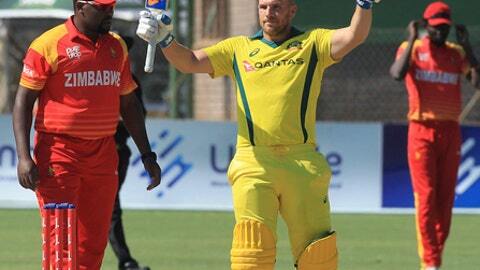 HARARE, Zimbabwe (AP) Aaron Finch smashed 172 off only 76 balls and broke his own world record of highest individual score in a Twenty20 as Australia crushed Zimbabwe by 100 runs in tri-series cricket on Tuesday. Finch plundered 10 sixes and 16 boundaries, and powered Australia to 229-2. He also featured in a record-breaking 223-run first-wicket stand with D’Arcy Short, who made 46 as they raised the first double-century stand in a T20. Zimbabwe was overwhelmed for the second straight match and restricted to 129-9 in 20 overs. Andrew Tye took 3-12 and Ashton Agar picked up 2-16. Australia sits on top of the table with two victories from two matches after it also defeated Pakistan by nine wickets on Monday. ”This innings is right up there. They don’t happen very often, so very pleased with it,” Finch said after receiving his man-of-the-match award. Zimbabwe captain Hamilton Masakadza won another toss, but his bowlers couldn’t find the right lengths against the fluent stroke-making of Finch. ”We thought it couldn’t get tougher than the first match, but here it was – got tougher,” Masakadza said. Fast bowler Chris Mpofu, who replaced injured Kyle Jarvis in the playing XI, was hammered for 53 runs without any success and offspinner John Nyumbu, who took the new ball, gave away 44 runs off his three overs. Remarkably, left-armer Tendai Chisoro conceded only 19 off his four overs. Finch broke his previous record when he hoisted Mpofu for a six over extra cover in the 19th over. He and Short perished in the last over. Short sliced a catch to wicketkeeper Peter Moor, and Finch tried to cut but was overbalanced and hit the stumps with his bat to be out hit wicket, three balls from the end. Zimbabwe, which went into the series without its top five players due to differences between the players and their country’s cricket board, never looked to come close to Australia’s big total. Top scorer Solomon Mire (28) struck three fours and a six in Billy Stanlake’s first over before falling in the tall fast bowler’s next over. Left-arm spinner Agar and Tye then pinned down the batsmen in the middle overs with Agar taking the key wickets of Masakadza (12) and Tarisai Musakanda (10). Zimbabwe needs to beat Pakistan in its next match on Wednesday to have any chance of qualifying for Sunday’s final.